As most of my readers know I am a historian who specializes in both the American Civil War as well as the years between the First World War and the end of the Second World War. 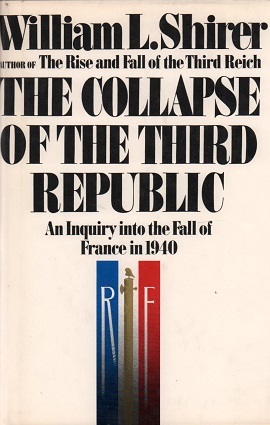 On of my favorite authors whose works specialize in the latter is the late William Shirer, author of The Rise and Fall of the Third Reich, Berlin Diary, The Nightmare Years, and maybe most importantly for Americans and Western Europeans today, The Collapse of he Third Republic: an Inquiry into the Fall of France 1940. The book is very pertinent for our time. Today, the American Republic faces a crisis that will determine if it will survive without becoming a totalitarian state in which the legislative and judicial branches are subordinated to the executive branch and an imperial presidency, and the overwhelming power of an elite oligarchy of industrialists, land owners, and bankers. The parallels between the Third Republic and the United States are many, especially in the attitudes of the economic elites and their responsibility to the Nation. On Tuesday there will be an election which most probably will determine the fate of the American experiment. The Collapse of the Third Repubic is a massive work, and Shirer was one of the first to gain access to the records of the Third Republic and to interview its political and military leaders in the years after the Second World War. For me, the most interesting part of this work is how many parallels there are between the French Third Republic in the 1920s and 1930s as there are in contemporary American life, culture, and politics. Those comparisons are too many to discuss in a short article like this, but there was one point that struck me as particularly important was the attitude of wealthy to the existence of the Republic itself. The Hobbesian attitude of the wealthy conservative classes in the Third Republic was not terribly different than many in the United States today, men and women who value their wealth and privilege above the very country that they call home and which helps to subsidize their existence. The French business elites, as well as their conservative allies hated the Republic so much that they were unwilling to support it and worked to destroy it, even if that meant overthrowing it and establishing an authoritarian state. 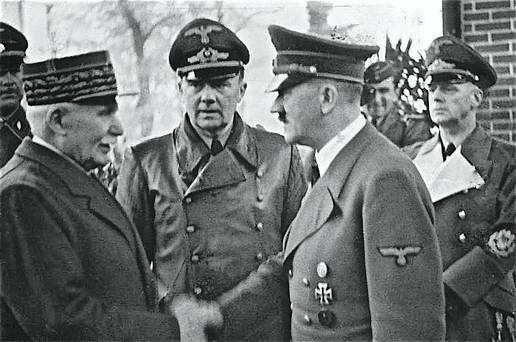 When the Germans defeated the French in 1940, many of these political and business leaders embraced the Nazis and supported the Vichy state. They were even willing to surrender true freedom and independence, becoming subservient to the Nazis in order to destroy the Republic. I believe that the French example serves as warning for us today when we see government and business leaders working to destroy the institutions that define our republic and are there to protect its citizens. Thus, Shirer’s book is an important and timely read for Americans today. There is much more in the book, including justified criticism of the French left of the time, but I will finish with this today. General Weygand, who led the French armies during the final phase of the German campaign against France despised the Republic. When it fell he said. “I didn’t get the Boches, but I got the regime.” A more traitorous comment could not have been uttered by a soldier. Will that be said of us someday?